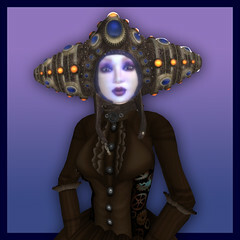 Last week I wandered into ~silentsparrow~ and caught sight of two lovely women wearing the coolest steampunk helmets ever. One of them was Noam Sprocket. He was in a high-waisted wedding dress and the one helmet that I haven't shown here. "We're trying to figure out what kind of outfit works with this," he said, spinning daintily. The helmet suited the froth of white very well. The other woman was Fade Dana, creator of these amazing helmets. She was in a short sleek frock, and the helmet worked with that too. She'd been working on these for months, and finally had them just about ready for release. "Let me know the second they come out!" Yesterday, vendors appeared in her satellite stores (she's still working on a main shop), and I am excited to share photos of two of the three helmets. I admit a special fondness for the Gruff with it's three horn options, but the Nautilus has a beautiful blue glowing facemask that makes anyone's features ethereally pretty. 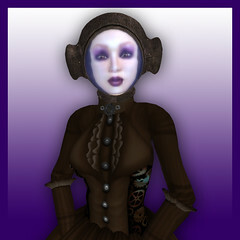 My own decision was to pair the helmet with hyasynth's steampunk frock, the Toxine, in a nice coppery-coggy shade. Some things in SL just make me want to squeak like a shoujo schoolgirl, and this is one of them. Have lovely Saturdays! Yesterday I was hit with the desire to shop at Chaospire. Whenever that happens, I emerge from the shop wondering where I think I'm going to WEAR the barely-there ensembles. This was no exception -- it's Chaospire's Nyxweave bodysuit (photo below). I'm glad the suit has magical spells embedded within it, because it sure as heck can't turn a blade. 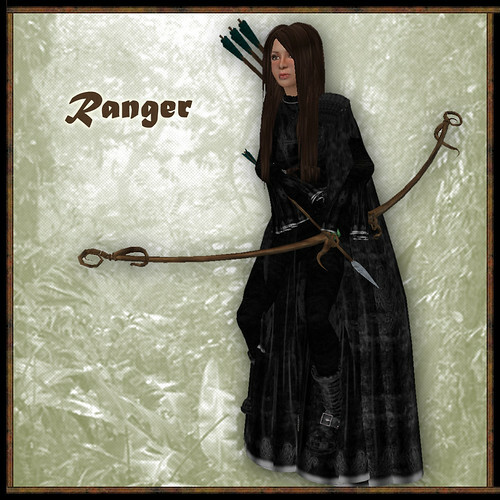 Adorned as I was, I decided not to photograph this outfit for the blog...that is, until Ellantha Larsson appeared, bedecked as a ranger. It must've been in the Second Life Weltanschauung this morning, the desire to step out of ourselves and into something completely different. 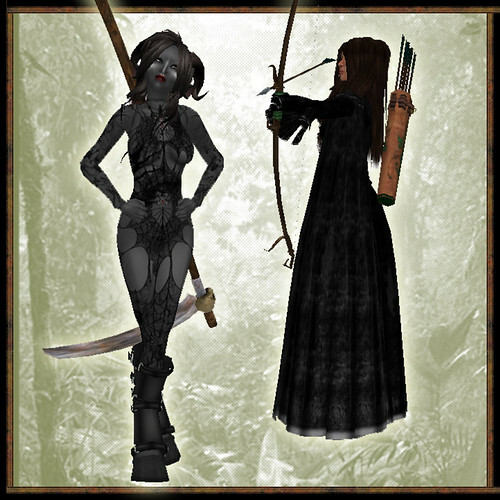 We stared at each other -- it was such an Everquest moment. We set up a few tableaux. It's really tough to photograph people with large weapons, and I feel sad that I'm not doing justice to the workmanship of the bow and skythe. 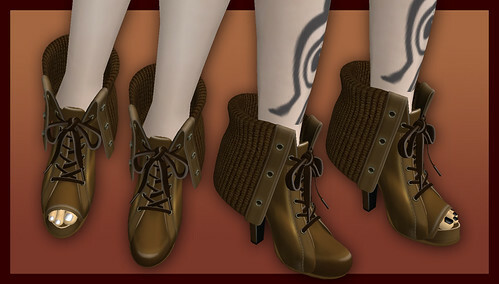 You can see them for yourself at the Aether Emporium (slurl below). Clearly, my poor half-clad dark elf just got pwned by the ranger. Darnit. Off to enslavement for me! Edit: Looks like the site is no longer active. I think it's this. People try very hard to be creative in Second Life. It's all a process, not a final destination. I know that if my first twenty or so blog posts had been pulled up for judgment on a site such as this (or hell, some of my posts now), I would never have found the heart to continue. In fact, it was difficult for me to post today because at the back of my mind was the fear that my photos would end up adorning the pages of this group. This is a personal reaction -- sites that tear down and criticize other people's works of design or blogging don't encourage people to try harder, they simply make them want to stop trying. I joined the group to see when my own fashion faux-pas would end up there. How sad is that? I know that this group won't go away, and I know that a lot of people don't mind it, but I'm going to try my best to pretend it doesn't exist now. Moving on. I looked up at the moon last night and noticed that it's almost full. In my mind I've been calling it the Big-O moon, the Obama moon, for no better reason than it was on the wax when we all voted just last week. Isn't it strange that it's been a week already? People have been busy in the past week, very busy. It feels kind of good to laugh, even if it's at my own nutjob of a Georgia senator. It feels good to laugh because I've been rethinking this whole graduate school thing. 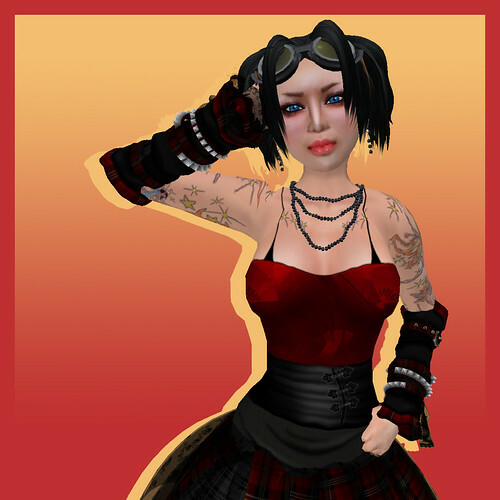 I know I'm close and all...looking at a graduation date of Dec. 09, but I'm trying to figure out whether or not I care as much about scholarship as I care about...say...fashion on SL. Should I take a serious stab at fashion writing, inspired by my work here? Should that be what I do after graduate school? To be entirely honest, I am too much of a slacker to do something for my occupation that I don't care about with a slightly obsessive passion. I don't know yet. I know that I'm signed on for another year of hard work, but I'm not certain I care about becoming a research professor any more. O HI, yes, I have yet to talk about my clothing. Lessee. 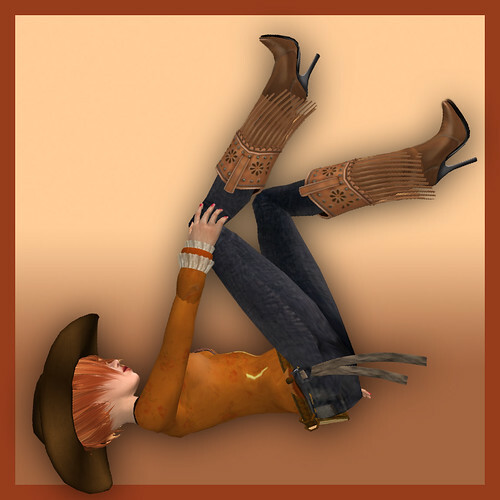 This outfit was inspired by the new boots from J's -- I mentioned the other day that J's has a few new releases in the shop. One is this pair, perfectly constructed western boots. These boots go so well with ~silentsparrow's~ new shirt that I had to slip it on, and then I realized I also had this jacket from Kurotsubaki hanging around. There's a deer on it. Surely the world needs more clothing with deer. ...Yes, I'm totally slap-happy today. Have a good Obama moon, everyone, hehe. 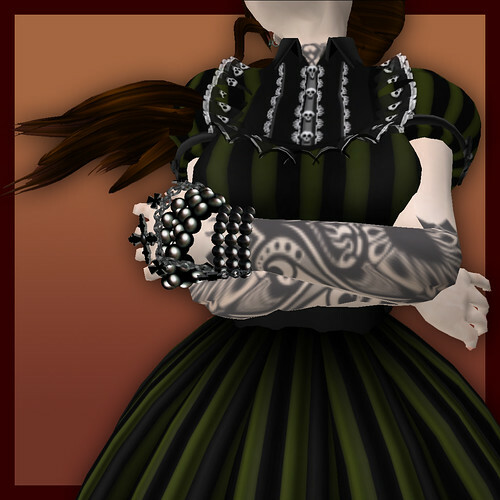 The rest of my outfit is a combination of amerie's Naughty (the cute skull-embellished skirt and neat armwarmers) and Curious Kitties (the PVC kimono top), and I am adorned with these awesomely macabre jewelry bits from DECO. I do love that the beads are little skulls -- look at the high rez photo on Flickr to see the skulls more closely. Ahaha, and on the closer image you can see that I've improperly fitted my earring. I FAIL! ...Anyway... The eyes are another pair from Treasured Vision, the Spirit Meditate. I like their freaky blue glow, as if I've been drinking the goooood Koolaid. I've got half a cup of coffee left and a free morning. I think I'll write House/Wilson slash and ignore my real work. Wahaha. You guys are gonna kill me. This is dedicated to the smart women who weighed in on Luna's post here. ILU guys. :D (*cough* And I love my outfit too -- credits tomorrow.). This morning the house was freezing. I crawled into bed with my daughter and used the poor child as a hand-warmer for a little while, sticking my icy hands onto her warm back until she said, "Mommy! QUIT IT!" and squirmed up. Then I went and got a sweater and a cup of hot coffee and decided to get a big fluffy coat for my avatar. I was inspired by the gorgeous Miss Piek this morning. She was wearing a coat from Baiastice, and I decided that I'd better go check out the shop. Sure enough, I found something that suited me, in a burnt-buttery shade that I've been wearing lately. View from the photoglobe. I put up some winter trees! I figured that the rest of me had better be quiet and let the coat talk, so I'm in sleek black from SLink, with boots from J's (note to J's fans: there are a few awesome new releases in the shop!). I had no idea that this thing came with a hat until I dragged the folder onto myself. Suddenly I had a big, cute pile of fluff atop my head! It was a bit difficult finding hair that suited the fluff-pile, but -Hiccup is always a safe bet. So far, -Hiccup's got some of the best hair for hats that I've found in my (admittedly limited) explorations. MiaSnow made a new dress, the Velvet Crush. It comes with a number of options, including a big long skirt as well as this short one, and there's a floaty layer of stars above the bodice. It has a deep, plush texture to the dark fabric, and the blue details in the neck bowtie, the bodice, and the skirt set the dress off nicely. I'm once again photographing in MiaSnow's macabre little photo-tombs in Hwang. I highly recommend hitting these up for all of your photo needs -- the backdrops range from bright to grotesquely dull, in the dense colors that MiaSnow is known for. Uhhh...*pokes brain* There's more stuff in there, I swear. I played around with machinima yesterday and made a small, lame one. On my agenda today is planning a bigger, cooler project while I avoid revisions to my prospectus... Hope y'all are enjoying the crisp, cool Brave New World we've got this week.